The PDF is free (and green! ); however if you would like a hard copy, you may order it here. Here is the long promised conclusion to Touch the Insight. Recall, that that posting was about an attempt to use physical prototyping not to get to a solution but to better understand the complexities in a challenge. And I happy to report that it was not a flop. 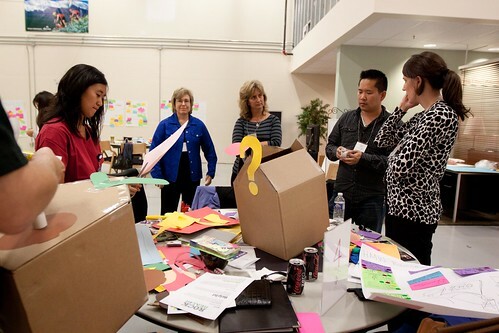 Turns out that prototyping insights is not that different than prototyping solutions. The main difference is the mental acrobats the design team performs in order to craft prototypes that give the sense of the insight. The best prototypes were the ones that used analogies. For example we compared one of our work process against traditional mopping (difficult) and the Swifter (mopping made easier). This allow the participants to consider how might we make our difficult process more Swifter-like. Most remarkable, was the rich and often heated conversations that the prototypes generated. Both are important elements. It is in the deep discussions that real meaning is discovered allowing the insights to move to the action level. The participants who played with the prototypes (and together) were more connected more deeply. Our Insight Prototypes are becoming a “Mars Rover” of sorts; they were designed for two 1-day immersions. However by popular demand they are lasting far beyond that original intention by a magnitude of at least 2 and up to 10. And that brings us to the final learning on prototyping insight: build for durability. It does not need to be indestructible, but should be usable for a period of time longer than you think. 3) Good insight will challenge convention. And when experienced en mass, healthy confrontation can occur. Be prepared for emotional exchanges, and be prepared to capture them. We used large stickers that participants could write their thoughts and then stick to the exhibit.